Modern roofing has come a long way since thatched roofing was conceived about 3000 years ago. 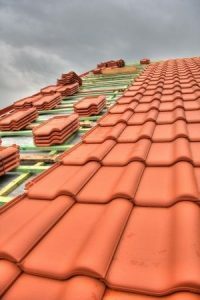 Now with essentially worry-free roofing options, synthetics and polymers have given homeowners endless options for the perfect mix of charm and durability, standing up to even the harshest of conditions. Though still very common around the globe- even in developed and wealthy countries of Europe- thatched roofing is pretty much the antithesis of maintenance-free. Traditional European thatching consisted of re-thatching over existing thatching of as old as 500 years! But given thatching consists of organic elements, such as reeds, sedge and hay, layering is required every couple years. By the 1300’s, more weather resistant roofing options were implemented as property owners’ needs began to evolve. Offering more trouble-free roofing options, the British began building roofs with slate. Essentially impenetrable to water and ice expansion, slate roofs could last a lifetime. Heavyweight slate required increased reinforcement to prevent collapsing and was harder to install, and was subsequently more costly. The same goes for flagstone roofing, proving simply too cumbersome in modern building design. So as more lightweight options were introduced, rock and stone options too became impractical- though still widely used in more affluent design. More lightweight options such as clay, wood and asphalt don’t offer the same durability and longevity as stone counterparts- lasting up to 40 years- but are much easier to install and subsequently much more affordable. The most popular roofing design for modern home design includes asphalt and even plastic shingles. In addition to a more manageable weight, these building options are much less fragile.